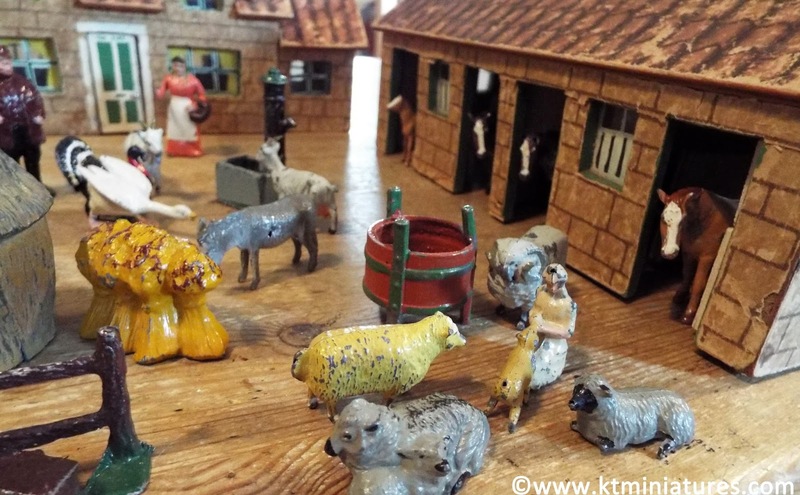 Possible New KT Miniatures Workshop Next Spring...Anyone Interested? 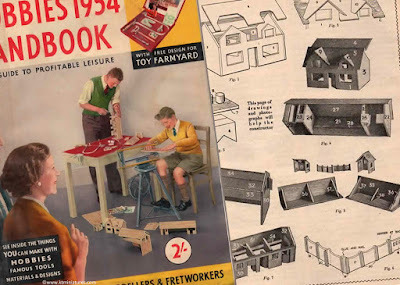 After Robin Britton and I closed the doors on our joint Nostalgia In Miniature Workshops venture in July of last year due to her retirement, I did promise to let you know when or indeed if I was to start the workshops once more. Well folks, I have news at long last. Yep, I am planning a new workshop for next spring. I plan on using the same ethos and basis as before ie. 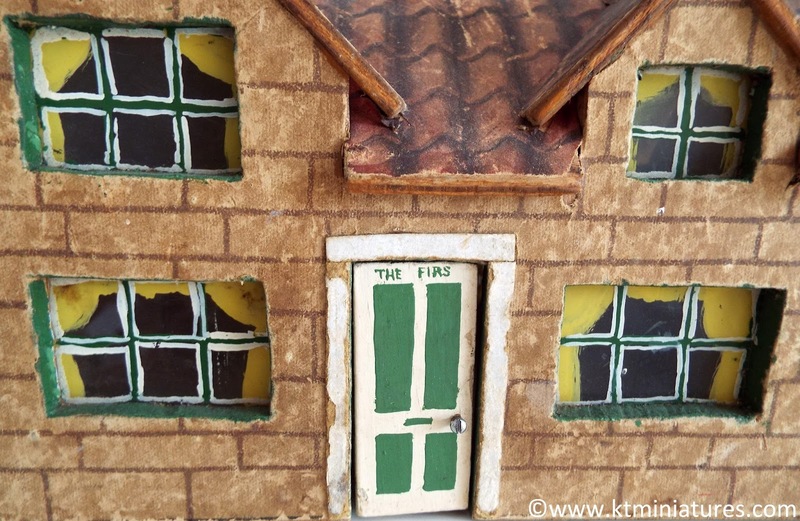 all are welcome, beginners and experienced miniaturists alike. Plus we will use ordinary everyday materials, as well as alternative techniques to create beautiful miniatures. It feels a little daunting and rather odd at the thought of doing all this on my own without Robin, but am very much looking forward to the challenge. Although actually she has kindly offered to assist on the day of any workshop and undertake duties such as hand out paint, glue and materials, and even engage in some friendly banter:). Ha ha...we can't keep her away! 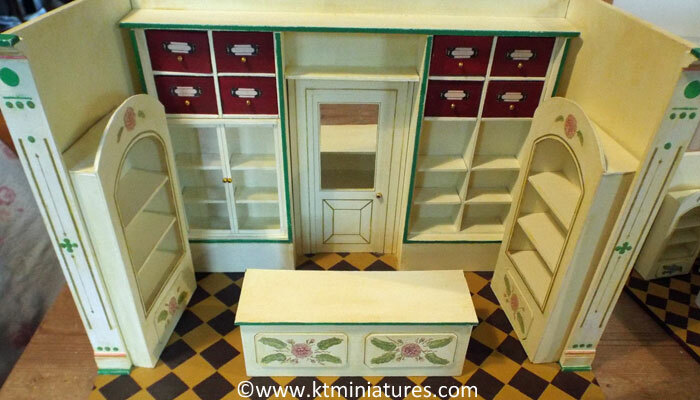 I do have a rather super project in mind of a freestanding 1/12th scale antique German style kitchen. It will have two sides, a back and a base plus separate pieces of furniture. In fact the basic kitchen frame is not too dissimilar to those which can be seen in these two wonderful old postcard images above. This particular project should be quite versatile and adaptable, and you will have plenty of scope to use your own imagination and creativity with it as you please. The real antique miniature German kitchens and accompanying furniture costs hundreds of pounds these days, and are becoming as rare as hens teeth to get hold of! 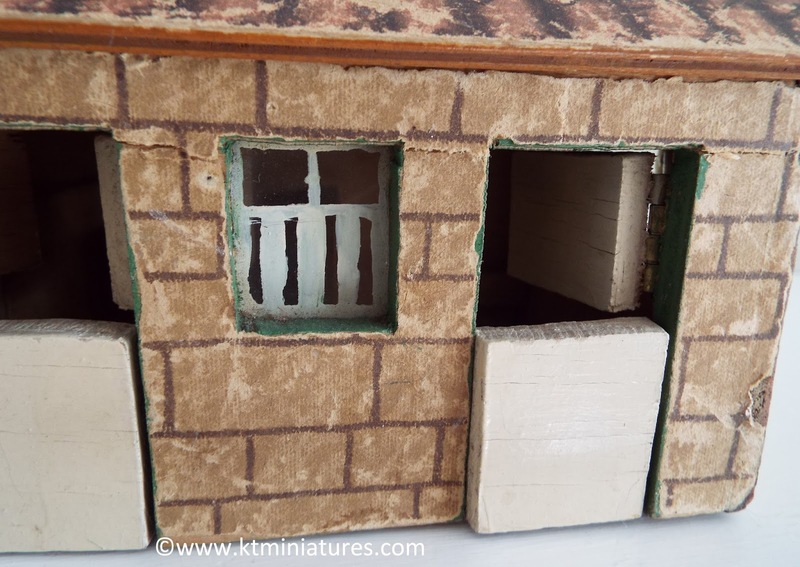 So I am hoping that this particular project may appeal to both antique and vintage dolls house collectors, as well as miniaturists alike. In the first instance I need to assess if there will be enough interest in this project to proceed. If there is, I will then try to confirm a booking with our previous workshop venue - Bicester Garden Centre (right next to junction 9 of the M40). And if that is unavailable then I will seek an alternative Thame venue. I am considering a Saturday in the spring of 2018 (although please see note below)*. Therefore if anyone reading this would like to confirm an interest in attending my workshop next spring without any obligation at this stage, then please do get in touch with me asap. 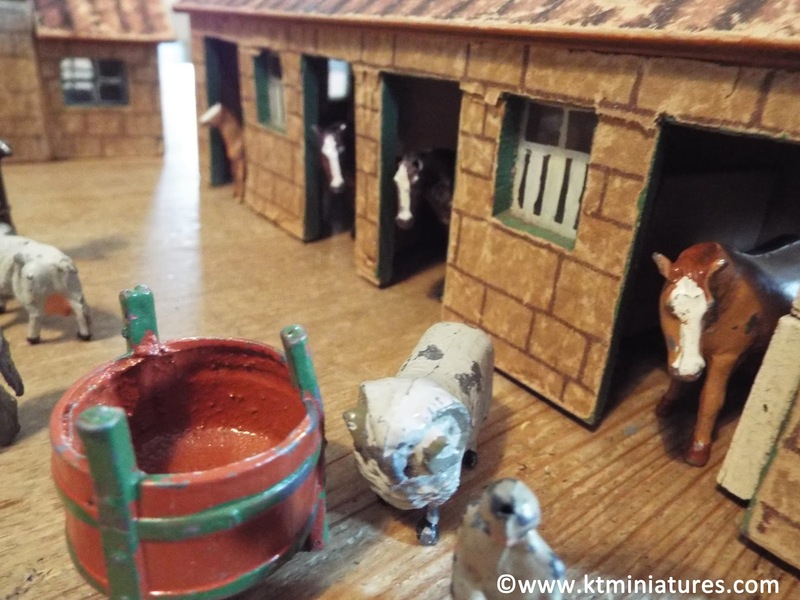 (email: info@ktminiatures.com) and I will add you to the "Possibly Might Like To Come To KT Miniatures 2018 Workshop List". Meanwhile I will crack on with the prototype. Due to logistical reasons I will have to limit numbers to no more than ten people at any one session. Am Considering Running The Workshop Over Two Days. *At last year's workshops, a few people asked if it was possible to run future workshops over two days ie. a whole weekend, as our projects have often been quite complex and it was sometimes felt more time was needed to complete. I am very open to this suggestion and am going to explore this possibility with the Bicester venue. However, I am aware for numerous reasons that some people will only be able to attend for one day...so am currently considering if there is a way I can do both options and keep everyone happy. Of course, as always with all our previous workshops, all attendees will be given a comprehensive folder of instructions plus a complete kit, so you can continue to complete your project at home. Meanwhile I will show photos of the prototype as it evolves over the next few weeks. 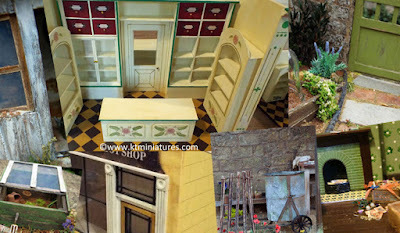 I am currently working on different variations of an old German style kitchen range - one of which can be partly seen above. Am planning on having variations in colour and design, so that it can be adapted to the attendee's taste and needs. 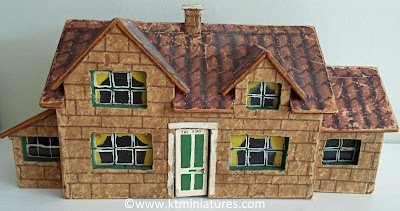 If anyone would like to be added to my KT Miniatures monthly "Workshop Newsletter" (is separate from KT Miniatures normal monthly newsletter) then please feel free to email me. 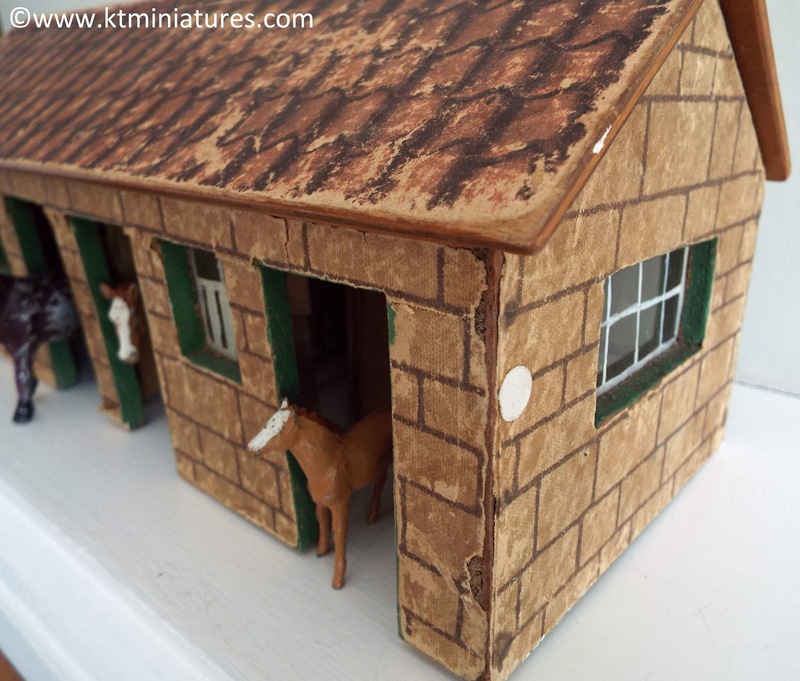 It is a very long time coming but I am delighted to announce that I have finally got around to creating a proper Archives section for KT Miniatures various antique and vintage dolls house items, some special collections and also handmade scenes...amongst many other miniature related items too. You will find the Archives link at the far end of the main navigation bar at the top of my website. Just click on the link and it will take you through to a main holding page. Simply scroll down and click on each relevant link that interests you. 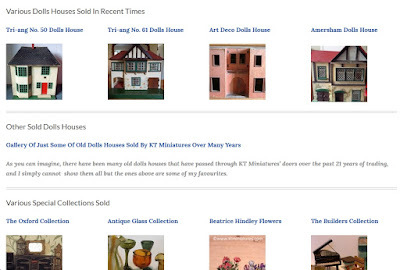 As you can see above, there are sections of sold antique and vintage dolls houses. 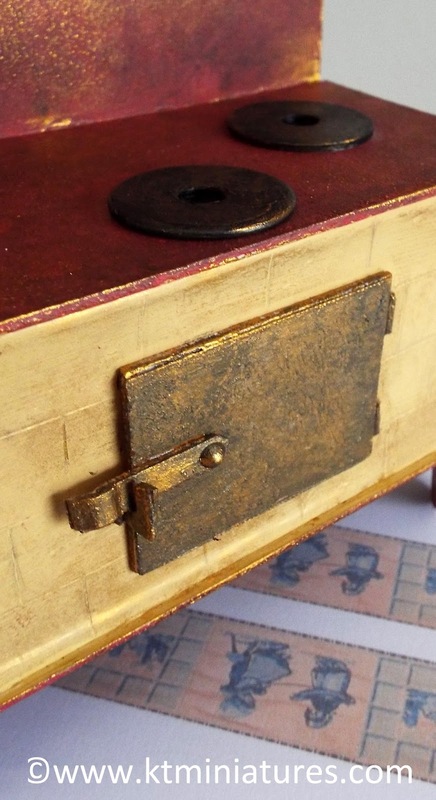 I will continue to add items of interest as and when I can, as I do have more photos and details tucked away in old files but all this is extremely time consuming, so it will still take some time yet before it is complete. You will also see special collections that have been sold over the years, such as "The Builders Collection". Long standing followers of KT Miniatures may remember these old items that were found in the loft of a house that was being renovated by a builder. He was going to throw the whole lot away in the skip thinking that they were rubbish but then discovered some pieces with "Pit-a-Pat labels on and rang me for advice! Needless to say I told them that they were quite valuable indeed and most definitely not to chuck them in the skip! The rest is history. 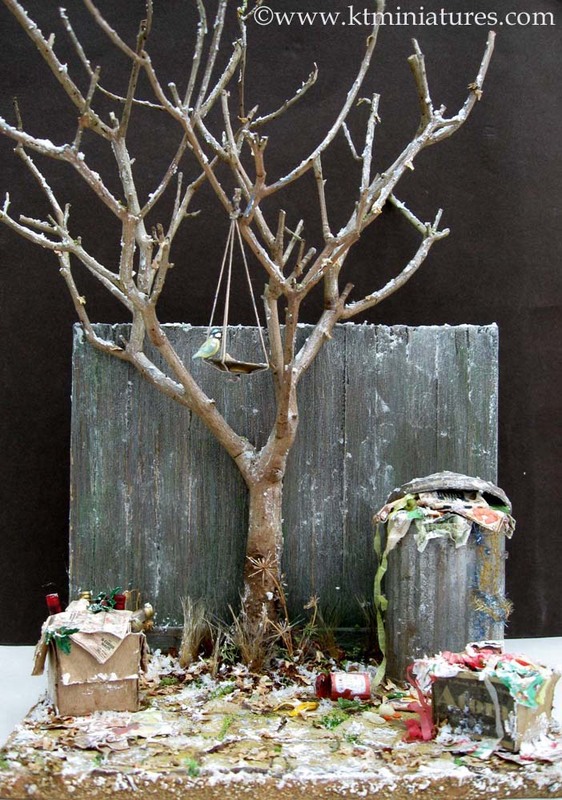 And can anyone remember the story of the lady who rang me out of the blue because she had found some miniature plants tucked away in a teacup at the bottom of a box of china that she had won at auction. 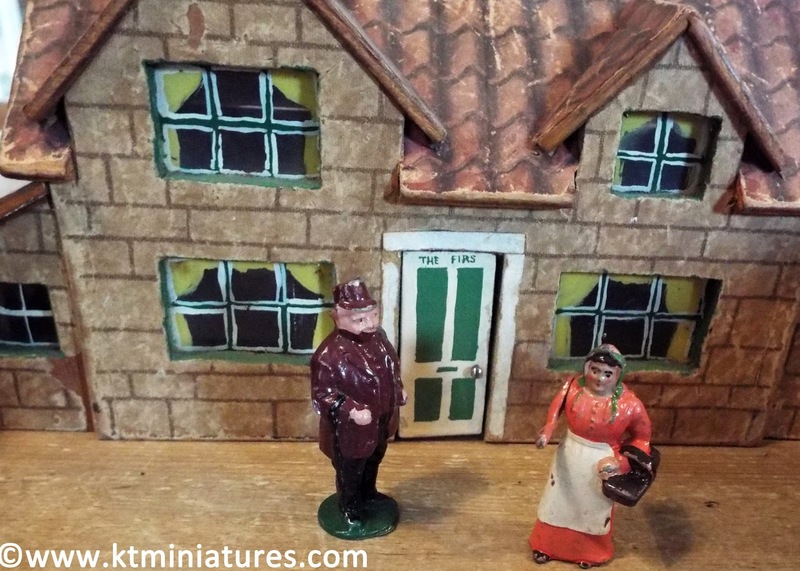 It was the china she was buying so was not expecting to find these tiny rare Beatrice Hindley treasures in her auction goodies. But after a little research she discovered that they were valuable and thankfully gave me a ring. I nearly fell off the chair when she told me she had four that she wanted to sell..ha ha... that really was a magical and rather memorable phone call! Amongst the Archives I have included several of my articles written over the years on various antique and vintage miniature items, including one about this intriguing 1920s/30s dolls house. 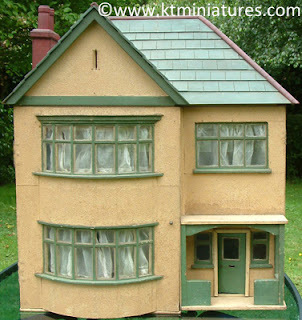 Or was it a dolls house - it had been suggested that it could have been a trainee architects model? Also included is a concise gallery of KT Miniatures creations. 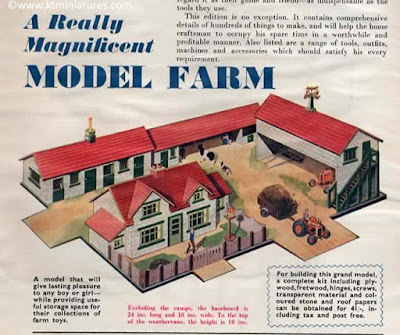 There are a variety of commissoned projects on there and projects created for various magazines too. The scene above was a commissioned piece of a wartime hospital ward at Xmas - was another favourite of mine. 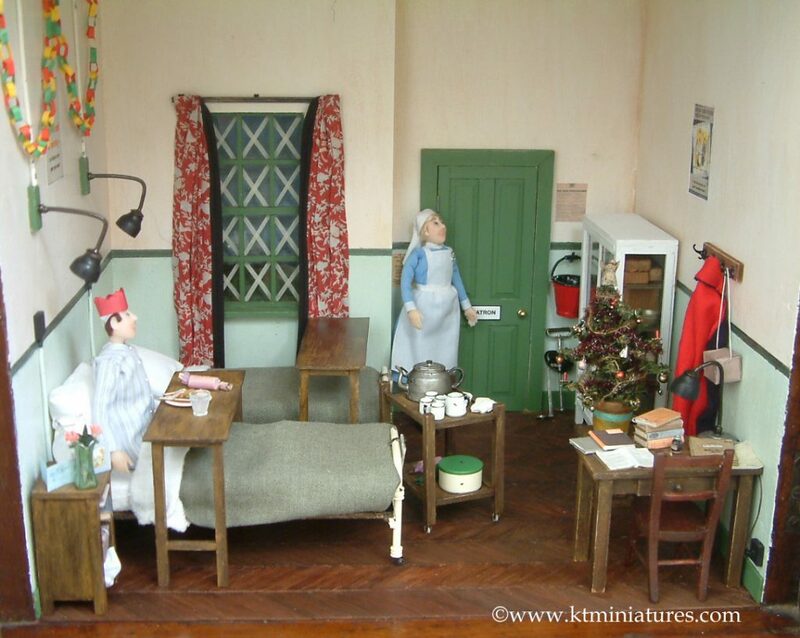 Plus there are joint projects with Robin Britton (my now retired workshop colleague) and miniature scenes I made simply to sell via KT Miniatures, all within this section. You will find one or two projects on there that are also in video form as well as a pictorial gallery form - including one of my most favourite projects of all time - Robin's and my joint magazine project - The WW1 Dugout, Trench & Poppyfield. 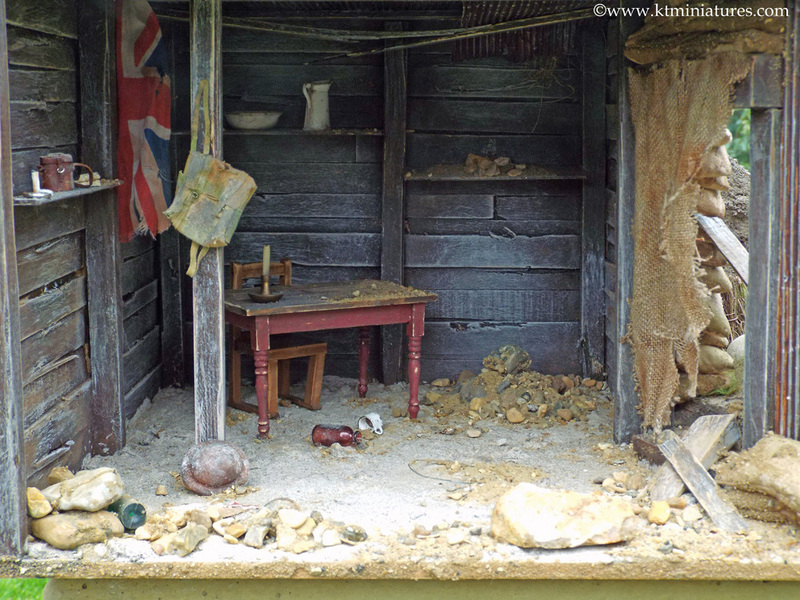 Later sold to raise funds for The British Legion. Plus On A Cold & Frosty Morning...The Morning After The Night Before. This again was auctioned off later to raise funds for Breast Cancer Campaign. 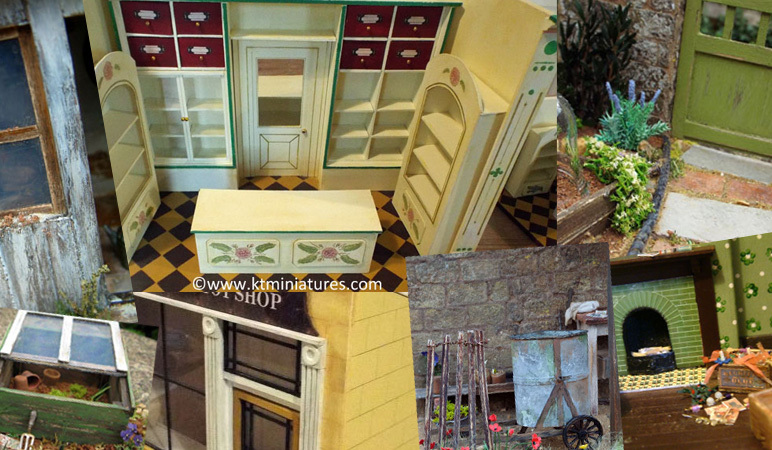 And finally right at the end of the Archives, I have included a pictorial gallery of all the workshop projects Robin and I created over several years, under the banner of Nostalgia In Miniature Workshops. Above you can see the very last project we undertook - An Early 1900s German Style Shop. 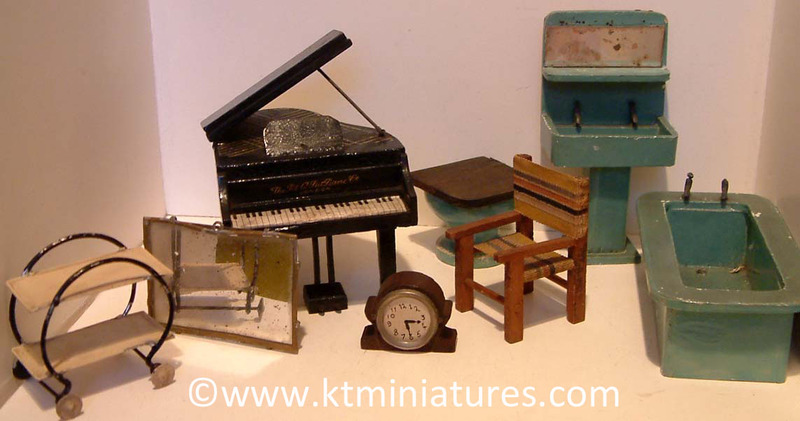 Well I have spent many hours and had great fun going through all my old files to create KT Miniatures Archives. Has brought back so many happy memories. 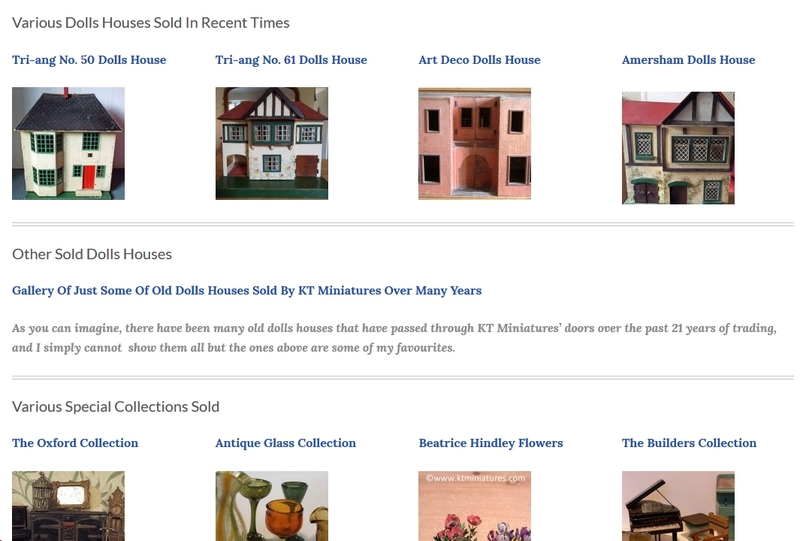 I hope that the information and photos will be of interest and a useful resource for antique and vintage dolls house collectors, and miniaturists alike. 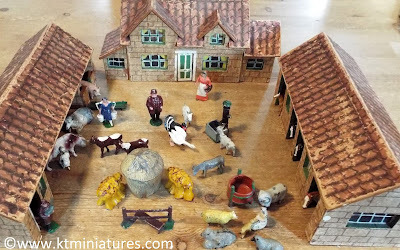 Vintage Hobbies Toy Farm No.249 Special & Assorted Lead Animals, etc. 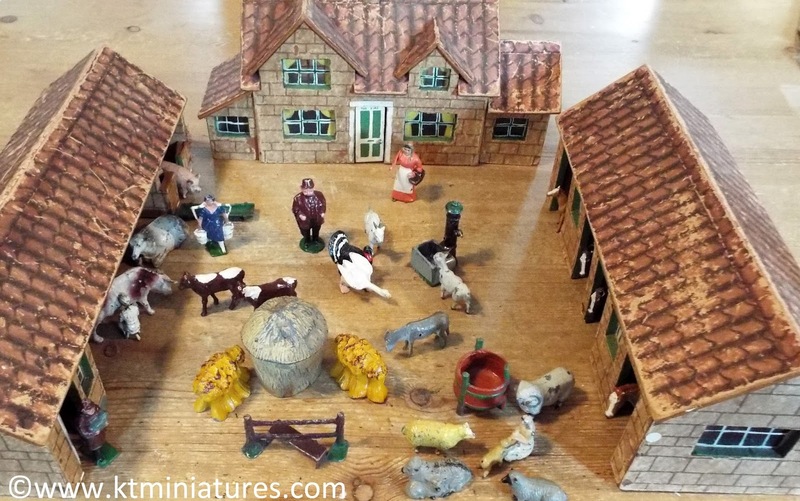 This set of three rather lovely vintage wooden farm buildings built from a Hobbies Model Farm Kit No.249, and array of assorted vintage lead animals, etc. went up for sale on KT Miniatures yesterday. 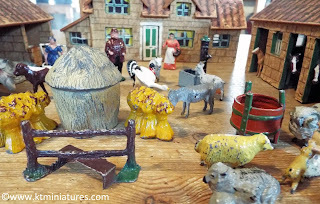 I know this is nothing to do with dolls houses but to those of you out there who like anything miniature, then this little farm set may appeal to you. It is bursting with nostalgia! The three farm buildings have been delightfully homemade from a Hobbies kit which, as far as I know, first appeared in the c1954 Hobbies Annual as a three page feature of instructions, plus full cutting plans. I believe that this kit and plans were available for a number of years, right into the mid/late 1960s. The farmhouse is exquisite. 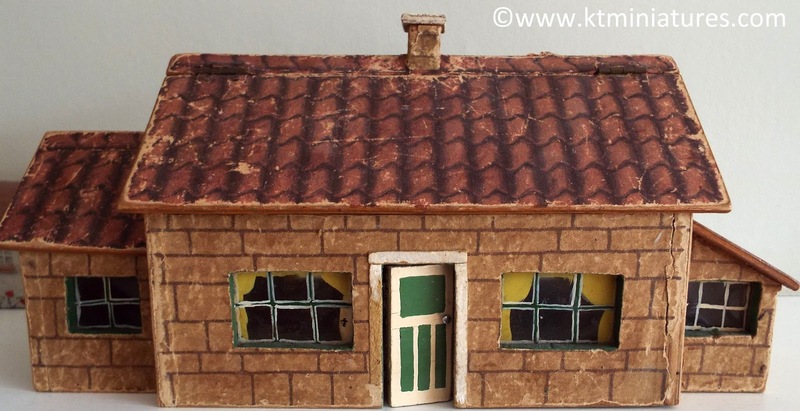 It consists of one main wooden house with two additional removable outhouses each end, plus a hinged lift up roof panel at the back.The roof paper is the instantly recognisable red version of the Hobbies roof tiling paper which was so often used on our old dolls houses. 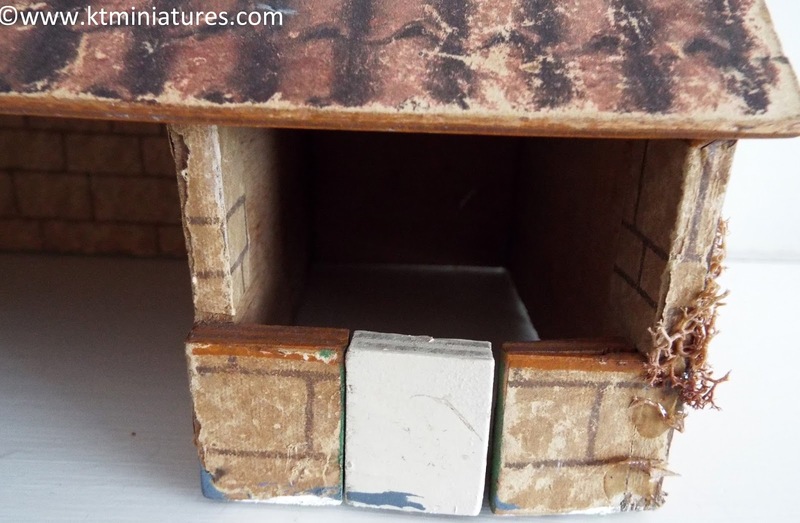 However, interestingly the walls are papered in what is described in the handbook as "concrete block paper". There are windows front and back, so too a front and back door, both hinged and opening. The windows are glazed with what is described in the handbook as transparent material. 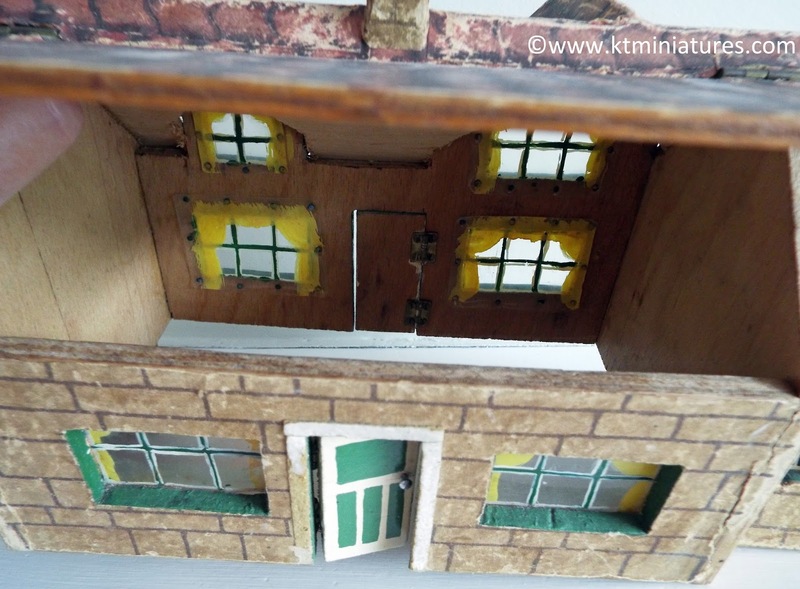 All the windows have hand painted glazing bars and yellow painted curtains. The farmhouse interior is an empty shell. The combined dairy, piggery and cowshed is also exquisite. The dairy room has a hinged opening door. The piggery has a half opening door and low wall. 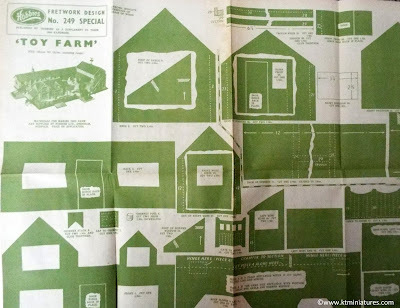 The area inbetween is the cowshed. The stable block is particularly exquisite too. 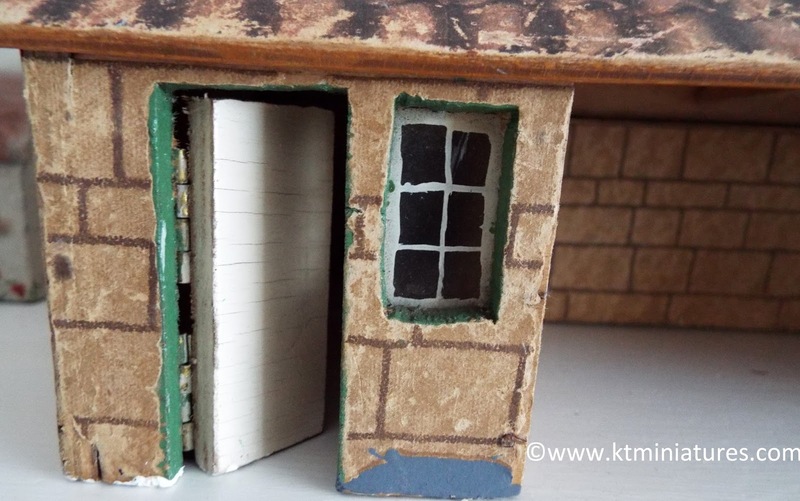 It has all four half stable doors, all hinged and fully opening. In the plans it shows instructions for a large barn too and fenced base, but sadly they are long gone. 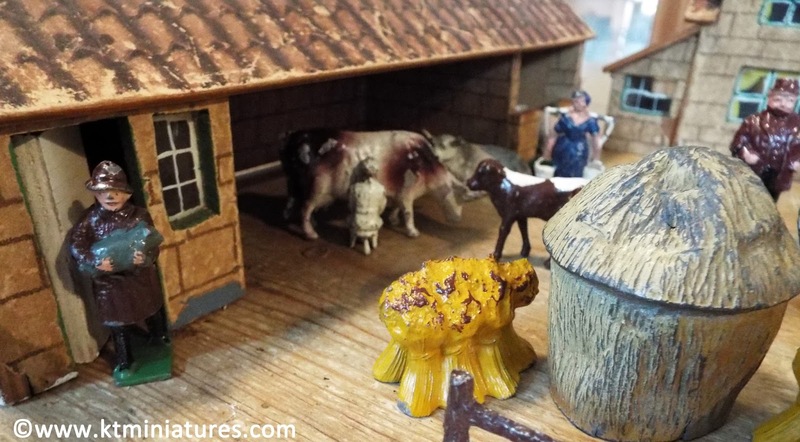 There are 31 lead figures, animals, etc. that are accompanying this little farm set. Obviously someone has collected these over a long period of time as they appear to range from the 1930s right through to the 1950s. 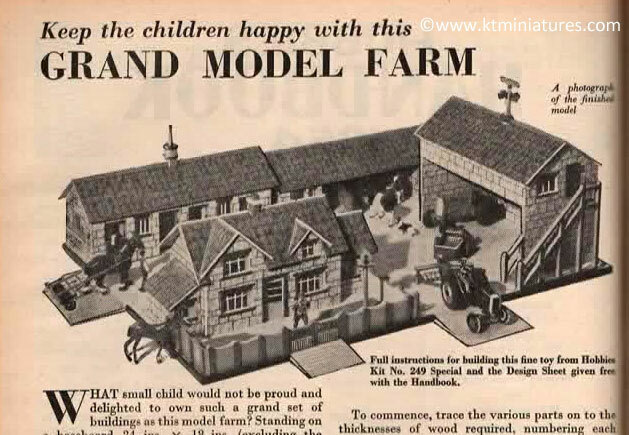 The manufacturers include Taylor & Barrett, FGT & Sons, Britains and John Hill & Co. 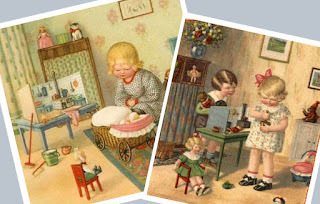 Antique and vintage dolls house collectors will recognise those names I'm sure. 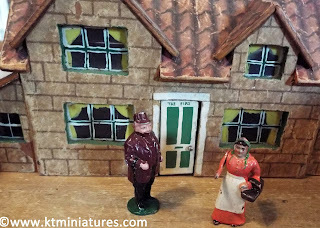 I personally am a massive fan of all things 1930s so I do have a number of Taylor and Barrett items amongst my own dolls house collection. 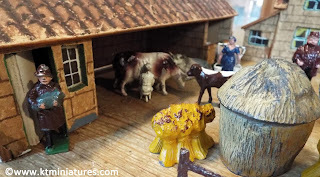 Meanwhile, I have had great fun setting up the farm with all the lead animals, etc. for the photographs. 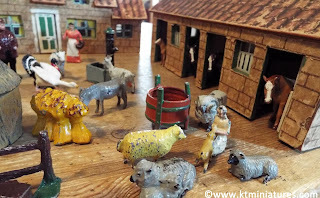 It has brought so many memories back as being a young child from the 1960s, although we did not have lead animals, we did have plastic animals and I spent hours of fun playing with my brother's plastic animals...(and cowboys & indians come to think of it).